The other day my friend Mandy posted a quote from Michael Pollan's new book Cooked. It reads, "Is there any practice less selfish, any labor less alienated, any time less wasted, than preparing something delicious and nourishing for people you love?" With one caveat, I would say that sentence pretty much sums up how I feel about pie baking. My primary motivation is not to develop my own skills, not necessarily for creative expression, or for a blog (sorry), but to make something to make something to share with friends and family. I like to bring pie with me when I go somewhere-- to a friend's house for dinner, a party, a show. It's celebratory, a way to show someone you care, yet still a small, humble gesture. It also explains why I often don't have "cross-section" shots on my blog-- it's not as nice to give someone a pie that's missing one slice. My one alteration, though, is on the idea of alienation. I get (I think, though I haven't read the book and am only working from this quote), what Pollan is trying to say--that food preparation for loved ones is unalienating because it positions us in connection to the land, to season, to familial traditions or culture, to our farmers, our friends and family. But today and throughout history, I think the actual act of food preparation can still be an alienating experience for many, especially women. I'm thinking particularly of the often lonely experience of the housewife, today and throughout history, and the 1st wave material feminists' all for communal kitchens--what compelled Zona Gale in 1919 to state, "The private kitchen must go the way of the spinning wheel, of which it is the contemporary." Despite these womens' work, much of that lone experience did not change. It's something that still needs to be acknowledged and addressed with creative solutions. 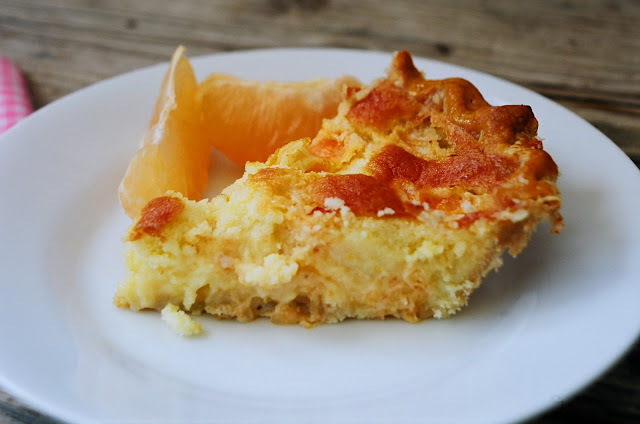 But when we think of those meals that have the most meaning, its those prepared alongside friends and family, for friends and family, that we remember.This Grapefruit Chess Pie was one such shared pie I made surrounded by friends, for friends. My best friend Heather was in town from Chicago for the weekend, and I was putting on a show at my house--an old-time string band "battle of the sexes" of sorts, featuring my pals Ariel, Chloe, and Meredith of Locust Honey and Brent, Graham, and Lars as the one-off Cowboy Coffee Drinkers. But before the music, we had an afternoon cookout. Lars grilled hot dogs, Leslie brought a Green Gate Farm kale salad, Brent and Heather worked on the long-awaited smoked salmon deviled eggs, Meredith's family brought a full tray of homemade chicken wings, and I worked on this pie, and a few others. The recipe comes from the Lee Brothers by way of A Sweet Spoonful. As for what it's all about, think pineapple upside down cake flavor in a custardy base with a sweet rye crust. It's a different rye crust than what I've used in the past, but I like it--it's also really easy to work with and hold it's shape beautifully, allowing me to experiment with a new crust fluting treatment. As the name suggests, it's a classic chess pie with a touch of early-spring citrus, a little something special for the common table. 1. In a medium bowl, whisk together flours, salt, and sugar. With a pastry cutter or knife and fork, cut in the butter until the mixture is the texture of cornmeal and peas. Drizzle the vanilla extract over the dough and sprinkle in the water 1 Tblsp. at a time, stirring with a wooden spoon until the dough begins to come together in clumps. Use your fingers to bring it all together in a ball. Divide the ball into two flat disks and wrap each in plastic wrap. Chill in the fridge for at least 1 hour and up to 1 day. 2. Once chilled, and you're ready to roll out your crust, preheat oven to 400 degrees F. Roll out one disk of dough on a lightly floured surface. 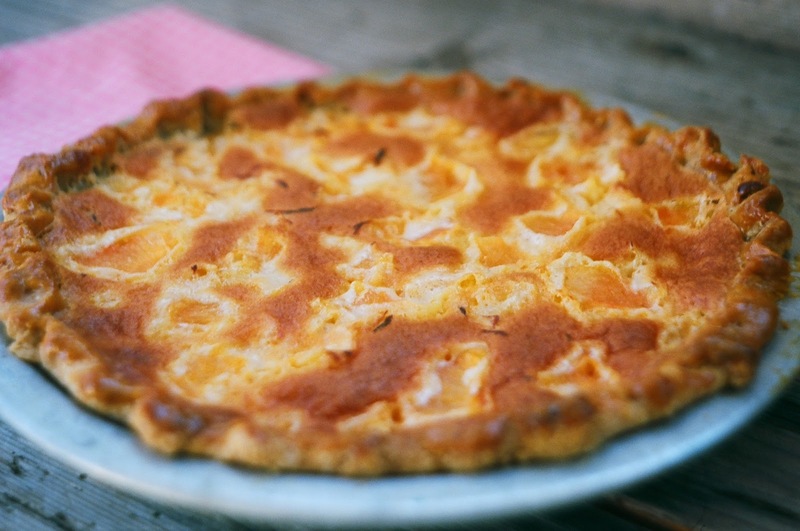 Fit into a greased and floured pie plate and flute edges decoratively. Prick the bottom of the crust all over with a fork. 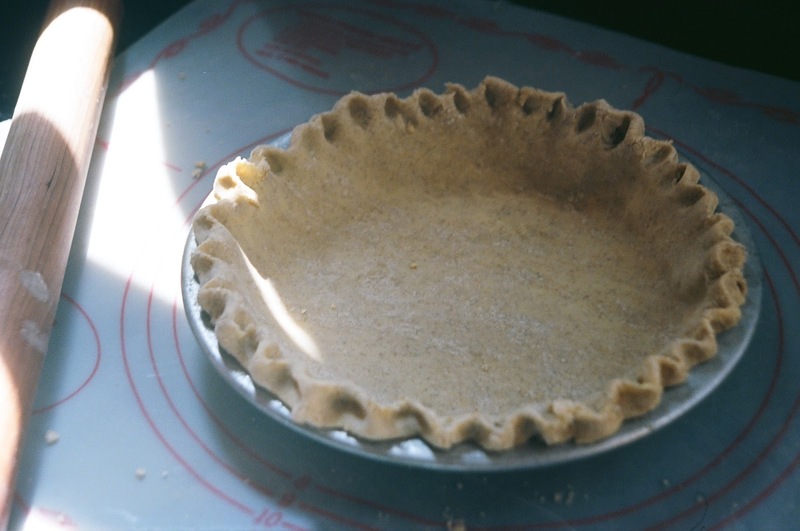 Place a sheet of parchment paper inside the pie crust and fill with dried beans or pie weights. Bake for 15 minutes, then remove from the oven and take out the parchment and weights. 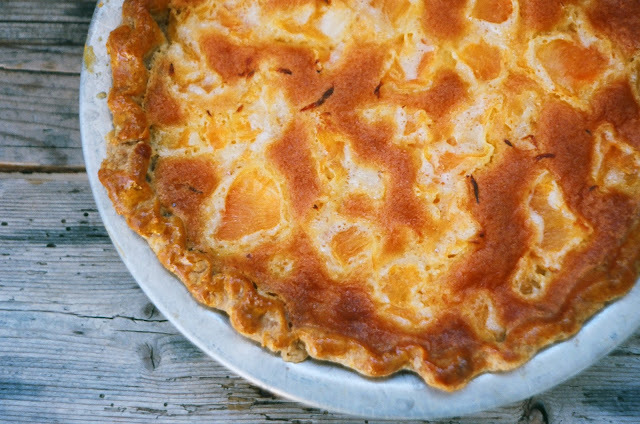 Brush crust with the egg yolk, reduce oven temperature to 350 degrees F and back 5 more minutes. 1. Preheat oven to 350 degrees F. In a small bowl, finely grate the zest of 1 of the grapefruits (it will yield about 1 tsp.) and set aside. Segment both grapefruits by trimming off the top and bottom so each end is flat. Then peel the fruit by placing a sharp knife at the point where the pith meets the fruit and cut with the curvature of the fruit. 2. Over a medium bowl to catch the juice, cut along the segment membranes of the grapefruit to separate each segment. Strain the segments and reserve the juice and segments separately (you'll have about 1 c. segments and 1/3 c. juice). Whisk the zest and salt into the grapefruit juice. 3. Whisk the egg yolks and egg whites together in a large bowl (I used a standing mixer) until they are light and cream-colored, then whisk in the cream and melted butter. 4. 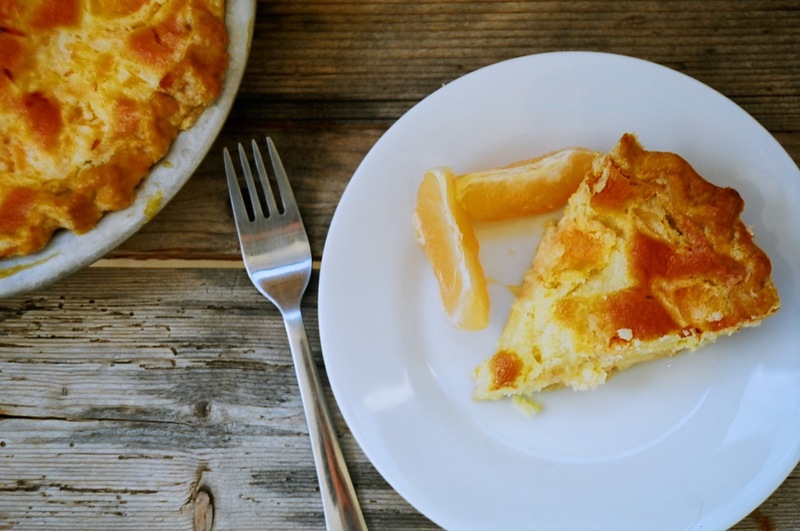 In a separate bowl, mix together the sugar, flour, and cornmeal. Add the dry ingredients to the egg mixture in thirds, mixing well after each addition. Stir in the grapefruit juice mixture until incorporated. 5. Pour the filling into the pie crust and arrange the grapefruit segments in the custard (they will float to the surface as they bake). Place the pie in the oven and bake 35-45 minutes until the top has browned and the center jiggles stiffly. Cool on a wire rack at least 20 minutes before serving. Serve slightly warm or at room temperature. Labels: Chess pie, grapefruit, grapefruit chess pie, grapefruit pie, Washington D.C.
i cant believe you didn't talk more about the chicken wings in this post.